Grosvenor Crescent, located in the heart of London’s Belgravia a short walk from Buckingham Palace, has been named the most expensive residential street in England and Wales, with an average house price of £16,918,000. The sweeping crescent, whose Grade II-listed properties are thought to have been built between 1837 and 1860, topped a list of the priciest streets published by Lloyds Bank. However, while Grosvenor Crescent’s residents are sitting pretty, with the typical price tag unchanged on last December, their wealthy neighbours in Eaton Square – which topped the bank’s table a year ago – have each typically seen more than £3m wiped off the value of their property in the space of 12 months, cutting the average price to just over £13.5m. Lloyds did not comment on why this may have happened, but Brexit uncertainty, plus recent tax changes affecting landlords and second home buyers, have triggered a slump in parts of the high-end central London market. Years of booming property prices mean the millionaires’ row phenomenon is not confined to the capital. There is now at least one “million-pound street” in every region of England and Wales, adding up to 73 in total, and stretching from Newcastle to Poole, according to Lloyds. The top six most expensive streets are all located in either London’s Westminster or the borough of Kensington and Chelsea, and all boast an average price tag of more than £10m. Grosvenor Crescent is made up of 28 houses and flats and, as with many parts of the country, the average price tag disguises huge variations. None of its properties are thought to be on the market right now, but one of the street’s most desirable homes, an eight-bedroom, eight-bathroom townhouse, sold for £25m in 2012 and, according to property website Zoopla, is now likely to be worth around £35m. Another of the street’s properties, an apartment said to be worth just over £18m, has a swimming pool, gym and private courtyard. However, those with less cash at their disposal may be able to pick up a small flat in Grosvenor Crescent for less than £2m, if one were to come to market, according to Zoopla’s latest estimated valuations. Seven of the top 20 most expensive streets in England and Wales are in Surrey, with three alone in the suburban town of Weybridge, with average prices ranging between £3.9m and just over £5m. Outside London and the south-east, the most expensive streets are in, or close to, Sandbanks in Poole, Dorset, an area dubbed “Britain’s Mayfair-on-Sea” that is home to former Premier League managers and millionaire businesspeople. 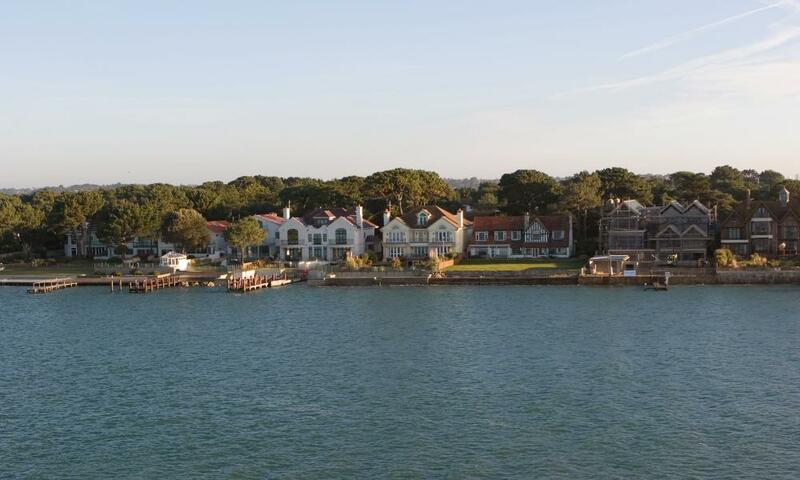 Panorama Road in Sandbanks, with an average price of just under £2.4m, was 20th in the table. In northern England, the most expensive street was Congleton Road in Alderley Edge, in Cheshire’s “Golden Triangle” favoured by footballers and celebrities. There, homes typically sell for just over £1.9m. In Wales, St Anne’s Close in Swansea, within walking distance of sandy beaches and coastal walks,took the top spot with an average price of just over £1m.